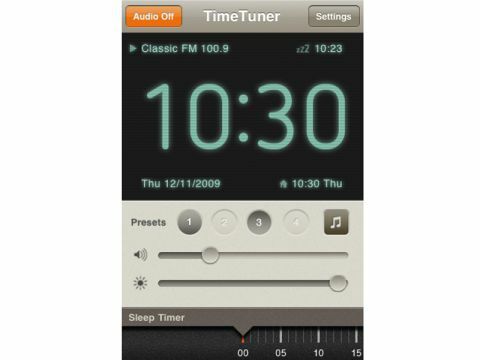 The idea of using your iPhone or iPod touch as a clock radio is not particularly original, but we like TimeTuner because it manages to pack so much in but at the same time feels elegant and useful. Designed to sit vertically in a powered dock (such as a speaker system), it displays a clock that shows any alarms you have set plus, optionally, the time in your home time zone; it's a boon for travellers. Tap the screen once and everything but the time display slides away. You can set multiple alarms and have them trigger on specific days, as you can with the built-in Clock app. Opt for either an alarm sound or for it to open an internet radio station. Usefully, you can define a backup sound in this latter case so that if it can't pick up the station you defined, it still wakes you up. It's also possible to listen to the radio at any time, or to hook into your iPod's playlists to play your music through the app. A clever, unobtrusive slider at the bottom of the app lets you set a sleep timer that counts down so you can fall asleep to music. Sadly, the only browsing option you have is by playlist – making it tricky to listen to podcasts or audiobooks. Although BBC radio stations are available through the service that provides the internet radio for TimeTuner, they don't actually show up in the app (with the exception of the World Service), presumably because they're using an incompatible codec. The app needs to be running for alarms to sound. However, we're paranoid, and always kept a backup alarm in Clock, although TimeTuner seemed stable as well as clean and well designed.